Today we will be taking a look at The Dark Knight Rises, a game based on arguably the best movie that has come out this year so far. The movie had raised everyone’s expectations sky high and managed to meet and exceed most of them. On the contrary, no one is expecting anything from the Batman game and with the history of movie tie-in games it would be a surprise if it is any good. We decided to find out if that is the case. The Dark Knight Rises’ story is based roughly on the events that happen in the movie. It goes without saying then that you should have watched the movie in advance or this game will spoil some key events for you. However, the game takes some liberties with the story, by adding several extra events that never take place in the movie, which is understandable because this is a game after all and there should be something extra for you to do. So you find yourself jumping from roof tops, punching the living daylights out of the bad guys, using some cool gadgets, and generally running around taking care of things in Gotham City. The Dark Knight Rises is split up in several chapters and in each chapter you have multiple missions. The game rushes through the story of the movie in the first couple of chapters and then stretches out the last section of the movie over several chapters. This is understandable as very little actually happens in the first half of the movie that could have been adapted for the game. For each chapter you get the objective on the screen and then you have to reach there and do whatever it is you have to do in that mission. In the early missions you will find yourself freeing hostages, disarming bombs and hacking into switches. 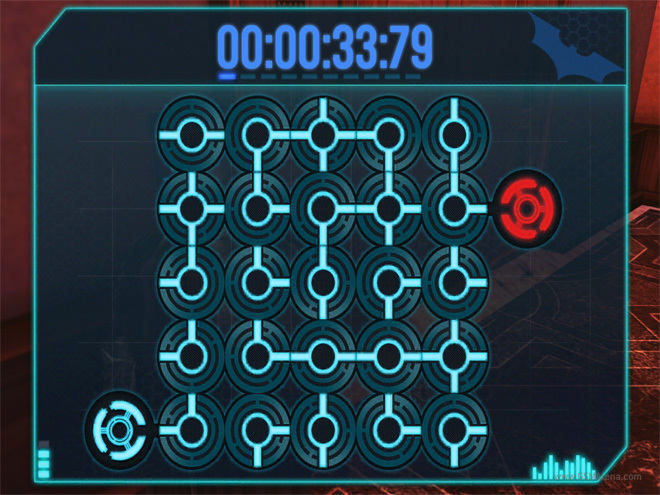 The hacking involves solving a puzzle, where you have to align all pieces before the timer runs out, although there is no real penalty for missing the mark and you just have to start again. You get a major sense of déjà vu while playing this game, mostly because it’s so similar to the two Batman games that came out on the PC and consoles in recent times. To move around the city, you can just run around or do the more sensible thing of using your grapple. Areas where you can grapple have a small circle and you have to press a button on the screen for Batman to just swoop over. Jumping down from rooftops is also easy. Just press a button and Batman uses his cape to gradually glide down. It’s all very similar to the previous Batman games. The combat mechanics are also the same. You keep mashing a button on screen to punch your enemies and Batman keeps rotating between various attacks until the enemy is down. After that you switch over to the next enemy, then rinse and repeat. 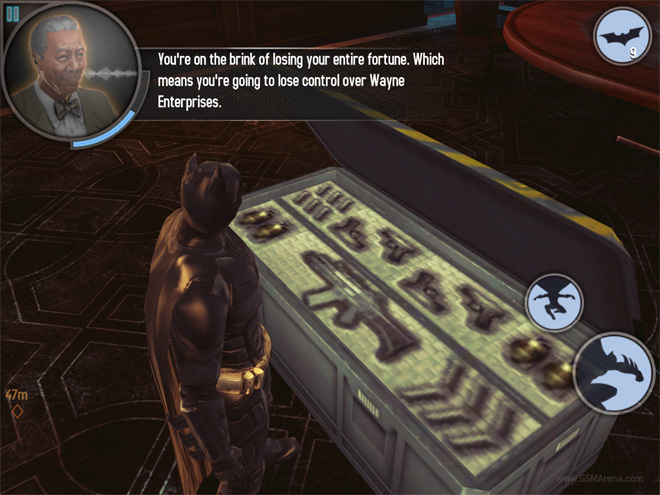 This game also borrows the block mechanism from the other Batman games, whereby you will get an indicator on the screen when an enemy is trying to attack you while you are engaging another enemy. 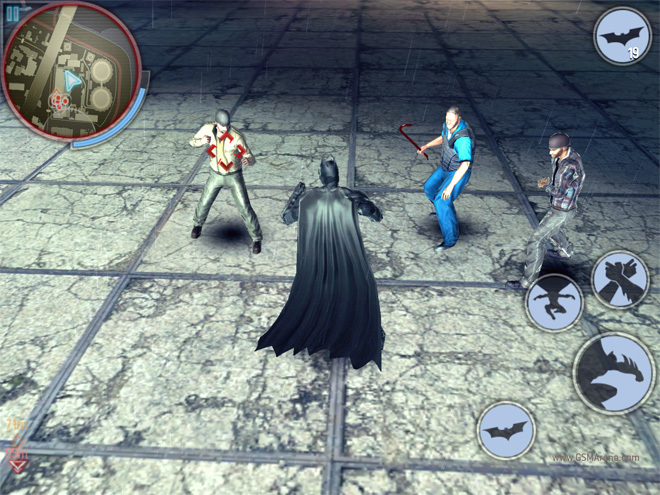 Pressing the button causes Batman to switch focus and block as well as attack the other guy who tried to hit you. You even get the same slow motion finishing moves, but this time it’s for every enemy instead of for just the last one in the group. There are some stealth mechanics as well. You can stand on a platform above an enemy and take him down with one key. Similarly, you can sneak up behind enemies and take them down. This rarely works, however, as somehow the enemies telepathically become aware of your presence around them and make stealth take-down impossible, with you eventually having to resort to good ol’ fashioned punching to take care of things. 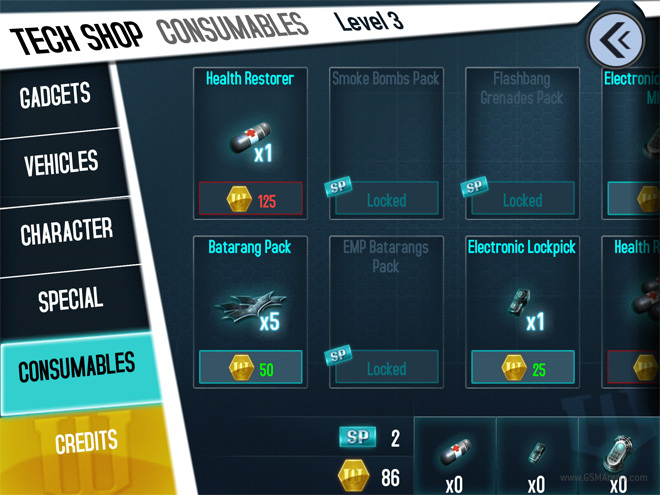 Taking down enemies gives you credits, which can then be used to purchase additional gadgets. One would wonder why someone like Batman would need to earn credit to be able to afford anything, but then, if you followed the events in the movie and the game, Batman is not exactly flush with cash at the moment. 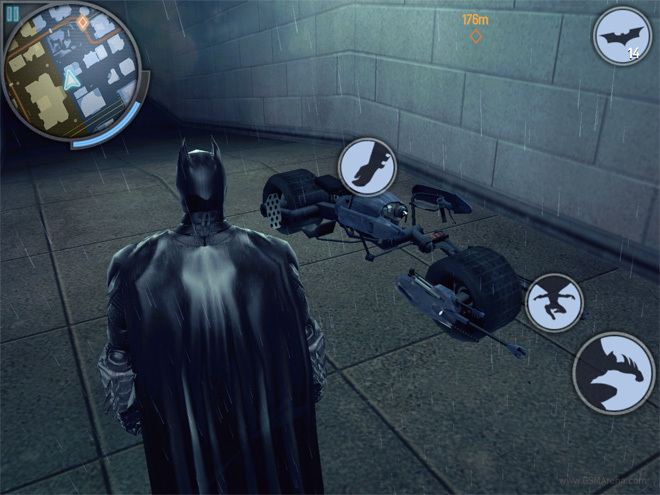 You also get to briefly control vehicles like the Batpod and the Bat, which is fun in the short time it lasts. Despite the obvious attempt to ape the other Batman games, one area where The Dark Knight Rises does not match them is in the quality of missions. They are mostly quite boring and just seem to be there to add length to the game. I became bored after the first couple of chapters, the game couldn’t hold my interest any longer. 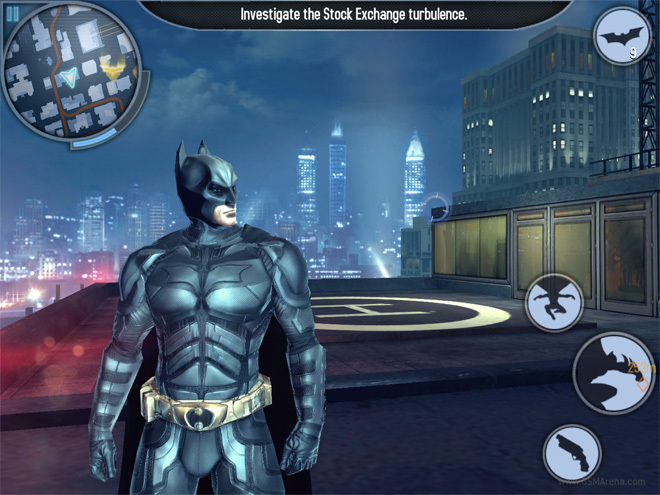 Visually, the best thing about The Dark Knight Rises is the enormous city Gameloft has created for the game. Gotham in this game feels like a real, believable place and you can just roam around and be amazed at how detailed this place is for a mobile game. And there are no loading times as you move around between the city. Other than that, though, the game looks fairly average. Batman and his suit in particular are very detailed but the details and texture of everywhere else range from acceptable to plain ugly. Even characters other than Batman use far few polygons than they deserve, making them resemble something straight out of the PSOne. Overall the visuals are no match for recent games such as Madfinger’s excellent Shadowgun and Dead Trigger and EA’s Dead Space. For the new iPad, Gameloft promises Retina graphics and the game mostly delivers. But it’s still sad to see that while the 3D elements are in high resolution, the 2D elements such as the buttons and loading animation are at non-Retina resolution. It also makes the low quality textures look especially bad when stretched out on the new iPad’s display. On the audio front, The Dark Knight Rises tries to emulate the voices of the actors in the movie. Voices for Batman, Alfred, Lucius Fox And Jim Gordon sound the closest to their movie counterparts. Voices for Selina Kyle, Bane and John Blake sound nowhere close, though. One issue with the dialogues is that the lips of the characters don’t move when they talk, so they just stand there stupidly staring at each other while the voices come out of nowehere. One thing I would like to note here is the massive size of the Android version of The Dark Knight Rises. Initially the game was an insane 3.6GB in size but Gameloft has managed to whittle it down to 1.8GB, which is much better but still a bit too much. The iOS version, in comparison, is just 819MB. Fortunately, Gameloft is now making use of the increased APK size limit on the Play Store, which means now you will download the entire game through the Play Store, instead just downloading an installer first and then downloading the rest of the files from within the app. The advantage of this is that the 15 minute refund period starts only after the entire game finishes downloading unlike before, where the 15 minute period would start with the installer and would likely end before you finished downloading the additional files from within the game. 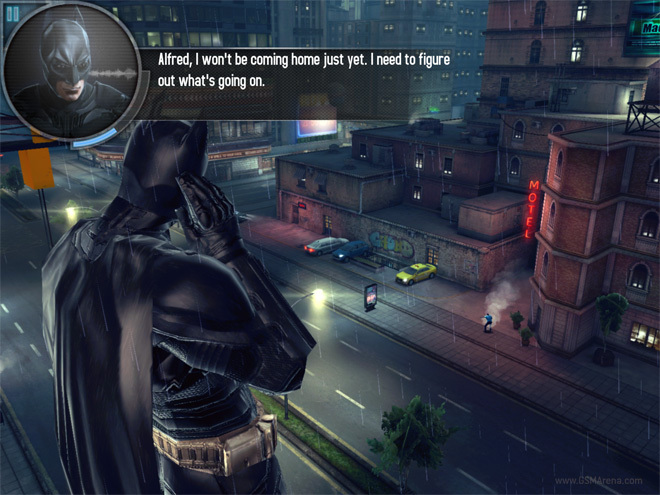 The Dark Knight Rises is not a bad game per se. Those interested in the Batman universe, particularly the latest movie, or those who loved the previous two Batman games on consoles and PC and want something similar on their mobile devices might find it interesting. Those who have played other recent games on their phones, however, won’t be impressed. The bar has been raised quite high even in mobile games these days and unfortunately, The Dark Knight Rises does not manage to impress in any particular area, being just an average game as a whole and not something you’d remember or would suggest others to download and play. At $6.99, the game is also well above the impulse purchase territory and people would expect it to be really great to justify that price, something it isn’t. So although The Dark Knight Rises is a decent game overall, a price drop is something we would recommend.